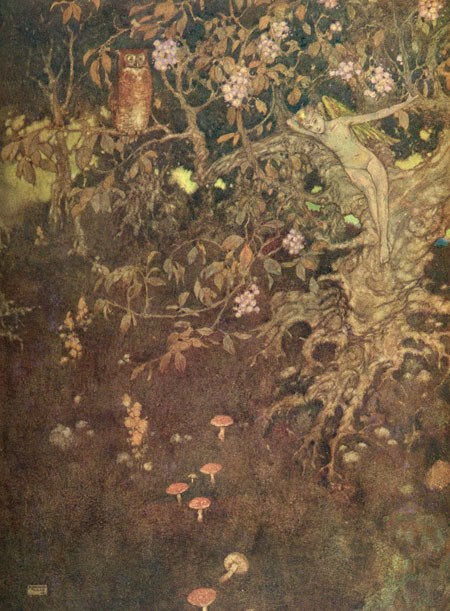 Not too long ago, I posted a blog focused on Arthur Rackham and his illustrations. 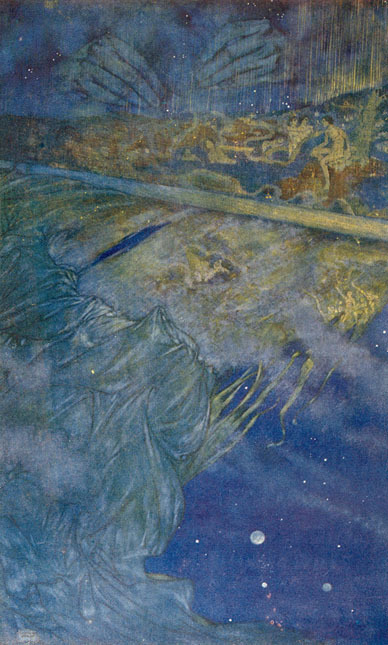 It’s time for Part 2, this time featuring Rackham’s most worthy competition, Edmund Dulac. 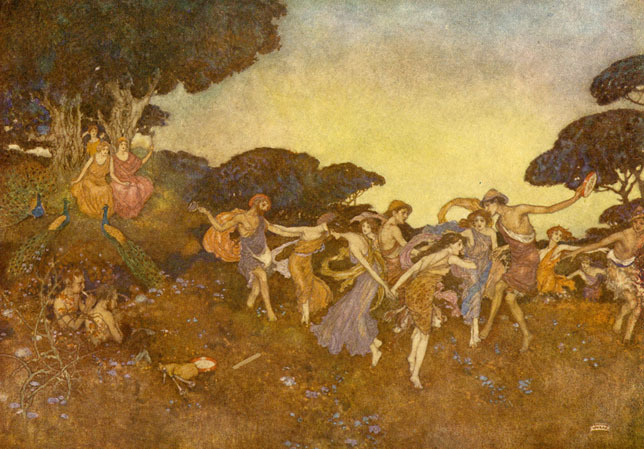 A year ago, when I was asked what I thought about Edmund Dulac’s artistic style, I said, “I think his illustrations are a little darker and less whimsical than the others [Arthur Rackham and Hugh Thomson]”. However, my tastes must have changed over time. 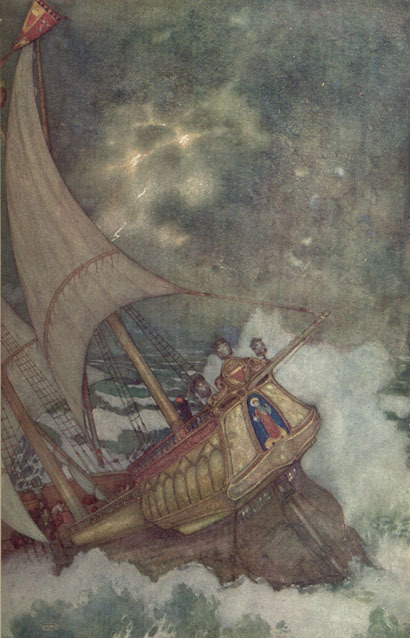 Looking through Dulac’s illustrations in Shakespeare’s The Tempest, I find myself in love with his use of color and the way he blends it so beautifully. It’s interesting to see the different styles, as well as the histories which led each artist to his renown. Fifteeen years Rackham’s junior, Dulac was born in France in the year 1882 to parents Pierre Henri Aristide and Marie Catherine Pauline Rieu. Growing up, he attended school at Lycee de Toulouse and after graduation, he moved on to law school where he studied for two years. But then he realized he couldn’t possibly continue a subject he found to be so dull. So in the year 1900, he transferred to art school at Ecoles des Beaux Arts where he honed his natural talents. (If you are, or know anyone, majoring in the arts, you can point Dulac out as a prime example of artistic success). So praised were his works that he won the Grand Prix for paintings in 1901 and 1903, as well as earning himself a scholarship to attend Paris Academie Julien for three weeks. By the time 1904 rolled around, he figured it was high time he remove himself to England, which is exactly what he did. In London, he was a huge success. At merely 22, he illustrated Jane Eyre without any previous book publications to his name. Much like Rackham, he illustrated occasionally for Pall Mall Magazine and he also followed in Rackham’s footsteps by illustrating books for publisher Hodder-Stoughton. In fact, it was when Rackham signed with a different publisher that Dulac picked up work from H&S. 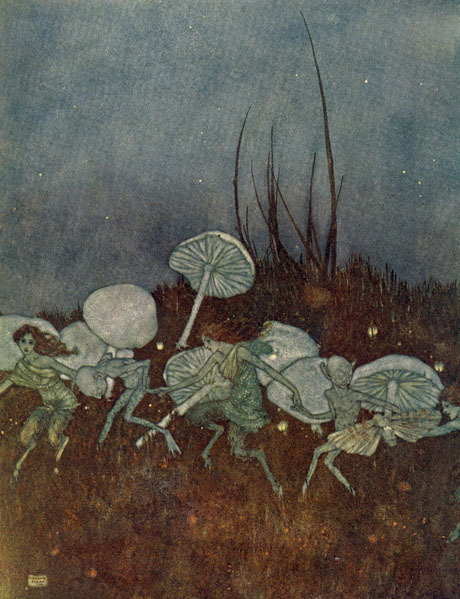 Unlike Rackham, however, Dulac had a different approach to his illustrations. Whereas Rackham used ink and then proceeded to fill the outlines in with watercolor, Dulac was really bold and cut the ink completely out of the equation. It was new. It was hip. He was a hit. Although his talents had a lot to do with his success, the market also played a critical role. Gift books were a cultural norm at the time, which meant he always had work. Unfortunately, that dream could not last. The end of World War I also signified the end of lucrative book work. For the rest of his days, Dulac lived paycheck to paycheck, creating caricatures, portraits, weekly drawings for The Outlook newspaper, and doing some theatre work. Not infrequently did he pair up with his buddy W. B. Yeats to create some sort of stage performance or something else of that ilk. Most notably was the creation of BBC Radio Program, My Own Poetry. The work was criticized, therefore causing a rift between the two friends. Thankfully, it was resolved before Yeats’ death two years later. Edmund Dulac did have a few consistent jobs after book illustration ran dry. Every week, he submitted a cover painting for The American Weekly. He also became the most prolific stamp designer in the world during World War II. Times were hard for him, but he made it through. He even got to return to book illustration in his last few years. Not surprisingly, his life contained multiple heart-attacks, the third of which took his life at the age of 70 on May 5, 1953. Today, we still enjoy Dulac’s works. Most notable are his illustrations of Sinbad the Sailor and Other Stories From the Arabian Knights; The Tempest; The Snow Queen and Other Stories from Hans Andersen; and his own relief effort books published during the first world war. All three titles here mentioned, and a single relief effort book, Edmund Dulac’s Fairy Book, as well as multiple other titles can be found in ARB’s holdings. We would love for you to come have a look and use them because what is pictured here is only a fraction of the magic you can explore!